Wow… This is a good thing! Big Brother Naija ex housemate, Bassey who was evicted right just before Bally has copped himself his first movie role since leaving the house. He revealed the great news via Instagram after he shared series of photos from the set of the new movie he’s starring in. The movie also stars actress, Ini Edo. Giving more insight on the production, actor Eme D. Ufot revealed that this production comes from the stables of the Royal Arts Academy, and it is being directed by Sobe Charles Umeh. This comes weeks barely two weeks after his interview with Olisa Adibua, where Bassey opened up on the gigs he’s dabbled in before entering the Big Brother Nigeria house. 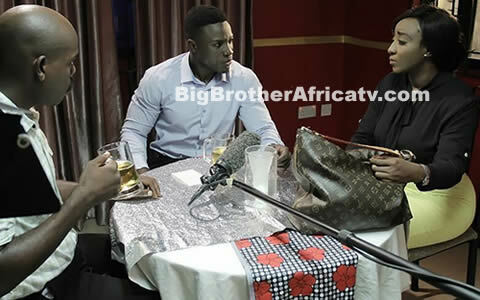 Bassey revealed his dream of joining the entertainment industry fully. “I want to be on radio, on TV – thank God I have you to coach me on that,” he told Adibua. Well, it seems the #BBNaija star’s dreams are gradually walking up and knocking on his frontdoor. Ini Edo also took to her Instagram to share a video with Bassey on set. To get the latest news and Big Brother Naija/Nigeria Live Feed Updates, kindly subscribe to receive email updates from www.BigBrotherNaija.net. Like us on FACEBOOK: Facebook.com/BBNaijaFans & Follow us on Twitter @BBNaijaFans for more Big Brother Naija News and Updates.